KUALA LUMPUR: The shares of newly-merged property and construction group Sunway Bhd were not immune to the weak market sentiment, closing at RM2.49 on their Bursa Malaysia debut yesterday, down 31 sen from the reference price of RM2.80. An analyst said investors were still reeling from the recent shocks to the global economy. 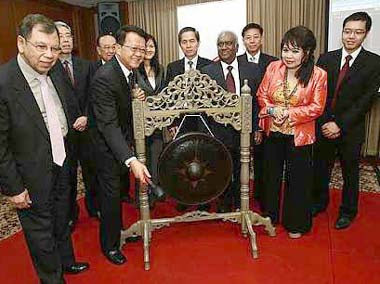 Cheah striking the gong at the listing ceremony. With him are the group’s executives and directors. “The stock is still undervalued compared to its peers as its price to earnings ratio and price to book value are still very attractive. There is more upside when the sentiments improve,” he said. Trading in Sunway shares kicked off at RM2.60, with 123,900 shares changing hands at the opening bell. It hit an intra-day low of RM2.40. “We are quite happy with the price at the moment given the circumstances. Markets go up and down, but the merger will make us stronger with more synergy and branding (value),” said executive chairman Tan Sri Jeffrey Cheah at the listing ceremony. The debut marks the completion of the merger between Sunway Holdings Bhd and Sunway City Bhd, which was initiated in November last year. 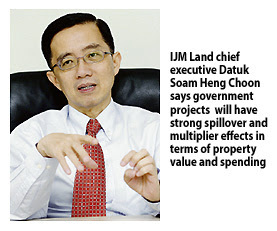 “With our size, we can now bid for more projects with higher values and access more capital markets, backed by enhanced liquidity and stronger credit profile,” he said. The group expects to derive 30% of its turnover from overseas investments over the next five years. “In line with that objective, we have allocated RM300mil to RM400mil for our overseas expansion,” said chief financial officer Chong Chang Choong. Currently, its overseas investment contributes 10%-15% of the group's turnover. Sunway will be looking at opportunities to expand in growth markets such as China, India and Singapore. Chong said about RM300mil would be utilised to develop the 95-acre Tianjin Eco-City in China which is worth RM5bil in gross development value. “The Tianjin project is very capital intensive as it involves land and development cost, and that is why we need to set aside such a huge quantum of funds for the project. The balance will go into funding our other projects in Singapore and India,” he added. The enlarged Sunway Bhd, with total assets of RM7bil and a market capitalisation of RM3.6bil, is also set to leverage on its stronger position and continue its participation in local construction projects. “We have been pre-qualified to tender for the My Rapid Transit project, and we are confident of clinching some of the contracts based on our good track record and experience,” Cheah said. Recently, the group was awarded the light rail transit Kelana Jaya extension job valued at RM569mil by Syarikat Prasarana Negara Bhd.